Flavor Text: "Going once! Going twice! Sold to..."
Since no one is the player with the highest cost, I would say that all revealed cards are put back onto the decks and shuffled into them. (I don't have a FAQ/rules statement to support this, but that would be the common sense solution. The card effect says "the player" with the highest cost card, not "any player" with the highest cost card. Well parsed! I accept your reading, thanks. I asked Damon about this as well. Calling Down the Ancients is specifically addressed in the FAQ because you'll notice, it it a targeted effect (since it says choose). This card does not target, so I suppose if they want to have an effect that targets the highest cost/skill/icon card, the FAQ will need to be updated. Ah, I see, that makes sense. So Calling Down the Ancients works in case of a tie because its player has to choose a card. (And probably also a card with "choose highest X" in its text is going to work, because the FAQ is likely to get updated if such a card is published.) But any other "do Y to the highest/lowest X" will not do Y in case of a tie... Did I understand you correctly? Yeah, it's also the difference between Disturbing Auction's "the card with the highest printed cost" (there can be only one eligible in order for it to take effect) and Calling Down the Ancients' "a character with the lowest skill" (select any one of the qualifying options). Can I use this if the top of my my opponent's deck is already revealed (eg by Archmage Attache)? If so, would it then be an auto-win/draw for me - since my card would be the only one revealed, thus it would be the highest cost? See the FAQ regarding "Then" verbiage. My understanding is that Disturbing Auction would be inoperable if any player currently already has their top card revealed. I would agree with Carthoris. You may not play Disturbing Auction if your, or your opponents, top card is revealed. How bad does this card stink? Disturbing Auction has to win the prize for "Least Likely Card to Help You Win a Game" in all of CoC. 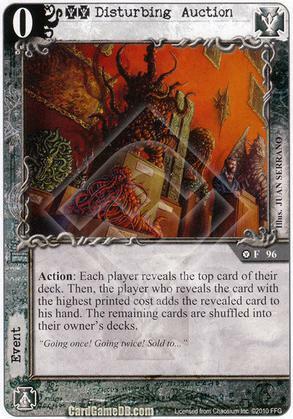 I have a Nyar/Avatar deck that is Shub/Order, and this card would be a perfect fit for that deck. I still can't add it to the deck though because it's impact is so minute. If it said "Then, draw 1 card" at the end, I could see the point of the card. So, I ask everyone out there, am I missing the point of this card? So, you draw 1 card and you cycle out your opponent's top card. So what?